This page provides you with .net Developer resume samples that you can use for inspiration in writing your own resume, or for creating one through our easy-to-use resume builder. Below you'll find our how-to section that will guide you through each section of a .net developer resume. To land the perfect job, you need the perfect resume. In today’s crowded job market, it is more important than ever to stand out among the competition. When you write your resume, it is vital that you get everything right, from the organization of the template to the details of your work experience. Here are some tips for writing the best resume possible. While there are 3 types of CV formats, for your resume we suggest reverse chronological. This means you highlight your most recent work experience first. In order to get noticed, ensure you choose a resume template that fits industry standards. 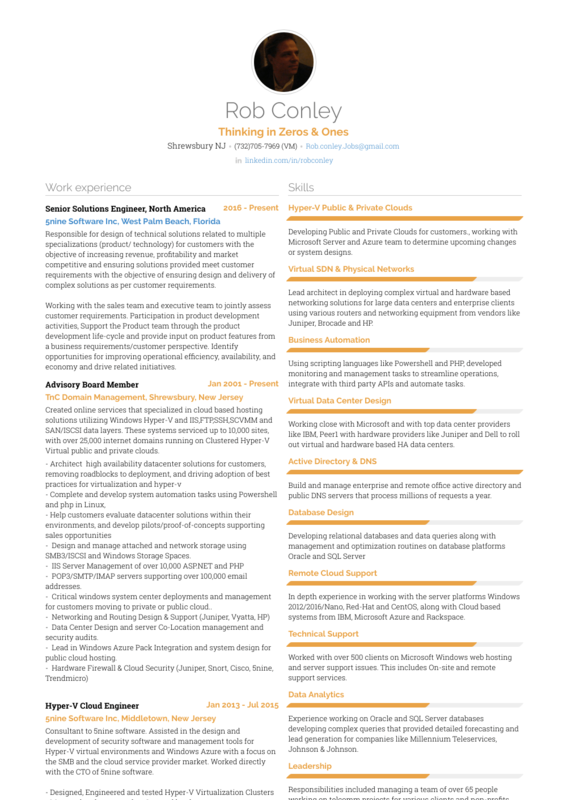 Check out some of VisualCV’s CV templates for inspiration. Ensure your future employer can get in touch! Your resume should begin with your contact information. It is very important that potential employers, having read your resume, know how to contact you! At the top of your resume, include your name, phone number, email address, and city. An objective is no longer a resume standard - employers know your objective is to land the job! However, adding a summary to your resume is a great way to catch an employers attention. This section is comprised of one or two paragraphs where you can feature your notable accomplishments and highlight your most valuable skills. Your summary should give employers a brief outline of your experience and capabilities and intrigue them to keep reading. Shorter than a work history section, in a skills section you can efficiently list your core competencies in a way that is direct and easy to read. Showcase specific skills and abilities that you bring to the job, focussing on those which distinguish you from the competition. The more useful and unique your skills are, the more you will stand out to an employer. Display your most relevant work experience in reverse-chronological order, beginning with your most recent position at the top of the section. Describe for each job your title, responsibilities, and accomplishments, with a focus on performance and results rather than duties. Use action words like ‘developed, ‘produced’, and ‘delivered’ when describing your work history to create compelling and impactful descriptions of your experience. Highlighting quantifiable information, like performance metrics and revenue, is a great way to demonstrate your abilities. What have you learned, and where did you learn it? Your education section should include the name of any post-secondary schools you attended, the degrees you earned, and any academic distinctions you achieved that you deem worth featuring. If they are particularly relevant to [category], you can also include major areas of study and important projects that you participated in. Like the work experience section, your education should be displayed in reverse-chronological order.